For a job site, emphasizing someone's visual appearance over everything else as the first thing that a potential employer sees is really bad, especially with the current diversity problem in tech. Emphasizing photos so strongly at the top like that looks like it's trying to appeal to narcissistic tendencies. Gitlab does a similar thing with the design, and it's the main reason that I stopped using Gitlab. Please don't do that with the header. The rest of the thumbnail looks fine. If it isn't already I would like to see the photo as optional/removable. Whilst diversity is never really an issue for me, I deliberately never include a photo with a CV. I have even withdrew an application for one firm who insisted I include a photo with my application. Additionally, I think having my normal Gravatar is also not something I would include on a CV. Note: This is an issue with the current system too. Thanks for bringing this up! The Developer Story has been in a limited private beta for a while now and getting fresh eyes on it will bring new feedback that is much appreciated. The Developer Story is our evolution of the traditional CV in a new format. It’s difficult to say if a left-aligned would be better than a centered aligned design. Considering it’s been in a limited private beta, we’d like to let the entire community test out the design before revamping it based on a screenshot in an email. The Developer Story should be available to everyone soon and we’re anticipating a lot of feedback on it, and we will adapt the layout if needed. Your second issue is surrounding privacy and diversity, and the avatar on the Developer Story. We take privacy and diversity issues very seriously when it comes to your information, and I appreciate you bringing this to our attention. We don’t currently have a feature to let you apply without an avatar but we’re definitely open to changing that. 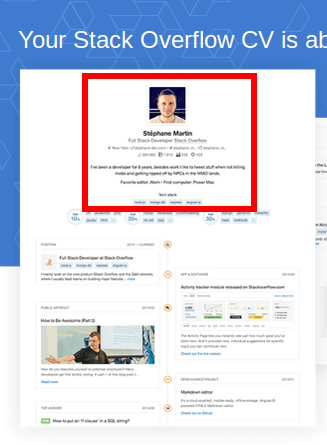 In fact, we’re thinking about allowing users to use their default Stack Overflow avatar that is generated during signup to apply, or even applying without the avatar all together. Either one of these would address the concern of using your profile pic when applying, but we’re open to other suggestions as well. Not the answer you're looking for? Browse other questions tagged feature-request design developer-story . New design: why don’t we use the maximum screen size?